For today’s #MondayMusing, I regret to burden you with the truth. This is a truth that I didn’t fully know before tonight so I’m not asserting any moral superiority here. We all had the nagging suspicion that Conquistadors weren’t such mensches, but how bad could they be? If you don’t want to know, then don’t read further. Many would default to the notion that revisionism of the Columbus story is a politically-correct act of sophistry engaged in by elitists and malcontents. They might argue that any reevaluation of Columbus Day is cynical because there is no absolute standard of good an evil; everything is just a matter of degrees and subject to moral relativism right? I mean Lincoln was probably a racist and MLK had affairs. So why not give Christopher Columbus a bye here? If I say, “Tienanmen square killings, small pox-infected blankets, an Auto de fe” – those are bad associations, right? But “cheap consumer goods, removal of the Indian threat to New York settlers, and the Reconquista”?- not so bad. And “Preservation of Chinese order and incremental change, Manifest Destiny, and the glorification of the Christian faith”?- pretty positive concepts to many people. 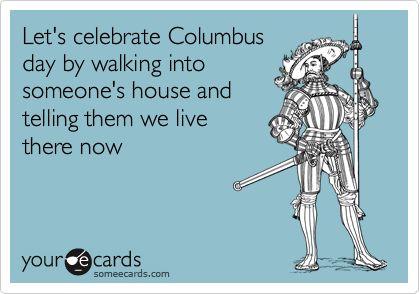 If what this blogger is saying is true, you may find the very idea of celebrating Columbus to be offensive. So what is the alternative? Maybe Portland got it right? Postscript: Did you know that I feel like Leif Ericksson sometimes? He was in North America centuries before Columbus. The investigation of TA-65 requires clinical trials because it is, in my opinion, a solid theory with compelling anecdotal evidence that I hear about daily from my over 1,000 patients. It deserves double-blind, placebo controlled clinical trials. I wish someone would help me fund these studies just to shut me up. I’ll contribute my time and expertise completely pro bono. Sadly, because no one can “monetize” this effort, there is not going to be any interest in investigating what I believe is our most promising cure for aging. As with the gap between the Vikings and the Conquistadors, we may have to wait five centuries for reputable science to discover what I am convinced is already the New World. There simply is too much money to be made in pick axes, Levi’s, and the quest for “El Dorado”. As for the Philosopher’s Stone contained in each stem cell and unlocked by adaptogenic substances from Astragalus that I believe in?…..
“we’re not going to take it” ….. comes the reply from the monolith of serious scientists! I’d contribute to controlled trials if you were to organize them. No offence there Ed but when you started going into Hindu mysticism as your base for understanding your concepts that’s when I had to bale. You may think your example shows intelligence when in actuality all it shows is a lack of understanding IN TO Gods Reality. As well as using human concepts that will only bring people into a knowledge of knowledge but not into a knowledge of a Relationship with God. Either your in or your out on that one Ed. You Choose.